When one thinks of the New York School the mind is instantly transported to New York City during the 1950’s and 60’s when it became a melting pot of visionary artists, writers, jazz musicians, and dancers. The individuals of this avant-garde circle drew their inspiration from Surrealism and the artists, in particular, were captivated by its philosophy of subconscious liberation. Out of this fascination, Abstract Expressionism was born. Canvases became dominated by highly abstracted forms, bold palettes, and intense gestural displays of human emotion where the finished piece was not just an image but rather a record testifying to the moment an artist’s brush met its surface. In the mid-fifties, Judith Lindbloom was barely 20 years old when she left the Midwest for New York City with only ten dollars in her pocket. She eventually settled in Greenwich Village, the birthplace of Abstract Expressionism. Franz Kline, one of the most notable artists from this movement, became a great admirer of her work. The two eventually developed a close friendship and often worked together in each other’s studios. By the time Lindbloom was 23, Kline secured Lindbloom a solo exhibition after her pieces appeared in the Whitney Museum’s Under 35 exhibit of young American painters. The exhibition sadly never happened after Lindbloom’s abrupt decision to exit the New York art scene. The young artist arrived in Europe where she concentrated on writing and photography rather than painting. Lindbloom did not resume painting again until she returned to the United States, relocating to San Francisco. Two of Lindbloom’s NYC era pieces will be exhibited. Both drawings, made with ink on paper, are reminiscent of the bold black line work of Franz Kline, although Lindbloom’s application tends for a more automatist western">Another featured artist, William Bond Walker, describes each of his paintings as a “new beginning”. Similar to the way many abstract expressionists’ work evolved during the process, Walker allows his paintings to develop intuitively rather than constricting his subject to a preconceived plan. This element of abstraction creeps into his representational work as well, be it a landscape, still life, or figure drawing. When approaching a new work, Bond Walker finds the power of color and its ability to shape a piece most important. The work in the show was made with acrylic, a medium he favors for its flexible and adaptable features. His oldest painting to be exhibited in this show dates back to 1953. He currently lives with his husband, John, in Lenox, MA. 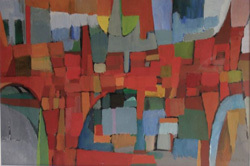 Walker’s fascination with color and abstraction is shared by fellow artist, Lionel Gilbert, whose work will also be exhibited. Gilbert fell in love with art at an early age and began his training at the age of 12 at the Newark School of Fine & Industrial Art in 1924. Upon graduating, Gilbert moved to France to study at L’Academie de la Grande Chaumier for five years. The young artist returned to the US in 1938 and like many artists living during the Great Depression, Gilbert sought employment with the nation’s W.P.A program, creating large murals in many public buildings in the US. During WWII, he was sent to England as an official U.S. Air Force artist to portray various aspects of Air Force life. After the war, Gilbert became a full time artist and instructor. He went on to show his work in various galleries in New York City through the 1980’s and taught at the 92nd Street Y Art Center. Rather than placing focus on the act of painting itself, as many Abstract Expressionists did, Gilbert chose to involve himself with the abstraction of his subject matter. This led him to replace rapid brushstrokes for blocks of color that were oftentimes organized around semi-automatist forms, which is reminiscent of the work that preoccupied Hans Hoffman in the 1950’s. Several recent works by Russell DeYoung will be featured. DeYoung, who has stated that his paintings are “an exercise of the imagination”, creates compositions that provide the viewer with an abstract vocabulay for the world around them. His multi-media approach, which involves oil, latex, wax, shellac, and asphaltum on panel results in an intensely textural surface that transcends two-dimensionality. Some may liken his work to that of the Italian artist, Alberto Burri, who is hailed as a model for abstract expressionists and an inspiration to Robert Rauschenberg. DeYoung received his MFA from the University of Connecticut in 1999 and has been showing with the gallery for nearly 20 years. Carrie Haddad Gallery is open daily from 11-5pm and is located at 622 Warren Street in Hudson, NY. Visit our website at carriehaddadgallery.com. For more information and directions, contact us at (518) 828-1915 or send an email to carriehaddadgallery@verizon.net.